A few years ago, Brandon Weber, CEO and Cofounder of Hightower, and I were catching up over a casual dinner in Brooklyn. We had met ten years earlier when we started our careers at Microsoft and quickly became friends. A few months before our dinner, Brandon left the commercial real estate (CRE) brokerage powerhouse CBRE, where we was a Vice President, to start Hightower because he saw that the industry was broken. He explained in fine detail the great paradox facing the industry. Despite CRE being a fifteen trillion dollar market and highly data intensive, many of the processes were manual and relied heavily on paper, excel and email. Additionally, existing industry standard solutions such as Yardi, MRI and Argus were siloed and 20 years old. Brandon explained that he and his cofounders, Donald and Niall, were starting Hightower to solve these problems. I was initially skeptical because I had seen dozens of real estate tech startups and many of them struggled to gain adoption with institutional landlords and brokers. CRE remained one of the major industries that hadn’t embraced the cloud and mobile. My gut told me there was a huge opportunity because at some point in the near future “software would eat” CRE. After spending more time with Brandon and his cofounders, they convinced me the time had come and they were the right team to back. They argued the market was ready because brokers and landlords were using iPhones, Google, Facebook and other cloud-based tools in their personal lives. These customers now wanted and expected the same quality of tools at work. As we dug deeper, it became obvious that Brandon, Donald and Niall were the right team to invest in because they had the unique blend of domain expertise and world-class product experience. A few months later, RRE Ventures was lucky to invest in Hightower’s seed round along with strategic investors Thrive, Bessemer, The Box Group, and Red Swan among others. In just two short years, the industry has changed dramatically and Hightower is helping to accelerate this change. Institutional landlords and brokers now recognize the need to adopt a cloud-based platform to streamline core processes, to enable real-time visibility into their portfolios, to lease space faster and to remain competitive. From dozens of conversations with both brokers and landlords, adopting a cloud-based platform is no longer a nice to have but rather a must have. They see Hightower as the initial foundation that will support the entire industry as it transitions from antiquated systems and adopts new technologies. 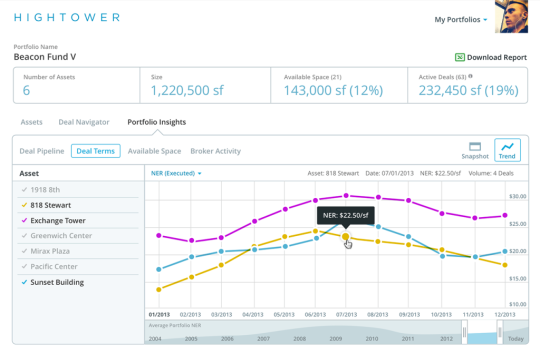 Existing customers are leveraging Hightower for many business processes including deal pipeline reporting, current tenant tracking, market data tracking, stacking plans, financial analysis, and portfolio reporting. So far the response has been overwhelmingly positive as evidenced by hundreds of millions of square feet on the platform, an NPS score higher than Apple, and virtually no customer churn. All the data suggests that 2015 and 2016 will be the year CRE comes online. With all that being said, I’m incredibly excited to announce that RRE is doubling down on Hightower and leading a $13M Series B financing with participation from Thrive and Bessemer and a handful of strategic real estate investors such as the Pritzker Group. The funds will be used to recruit and hire world class talent, enhance the Hightower platform and continue to provide our customers with high touch support. We’re significantly expanding our investment for a variety of reasons. First, we believe that Hightower has built the best team and product in the industry. Most importantly, customers feel the same way. The dozens of owners and brokers we spoke with said Hightower has helped them increase sales velocity and operate more effectively. We also discovered that informed customers have chosen Hightower over the current alternatives and the competition’s customers are defecting. In fact, they’ve had nearly 100% trial win rate over the competition. Additionally, Hightower has a robust product roadmap and trajectory. They’re consistently first to market with the latest features and respond quickly to customer needs. With this funding we’re ensuring that Hightower is here to stay and will become the market standard. The company is now well positioned for long-term success, stability and growth. Since RRE’s seed investment in Hightower we’ve been very lucky to partner with a handful of innovative real estate startups such as Managed by Q, Floored, Breather and The Square Foot. While each one is transforming CRE from a different angle, perhaps the biggest disruption and most value created will happen within information aggregation and sharing. This is the cornerstone of the industry because it’s where the listings and deals reside. By having real-time visibility into the data, both brokers and landlords can move faster and close more business. Hightower is building the system of record for the industry by providing world-class workflow tools built around leasing. Based on all of these developments and many others, I’d argue that CRE is no longer a barren wasteland for technology but rather an oasis for innovation. CRE technology is a trend that’s reshaping an old and a multi-trillion dollar industry and Hightower is building that foundation of change. I’m excited to say we’re just at the beginning. The future of CRE is here.